We all want to raise a reader. 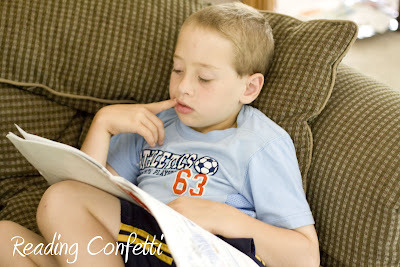 In my family we’ve found ten favorite book-loving picture books and ten book-fun activities. 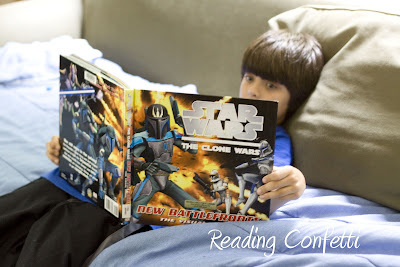 Try them and see if they inspire new ways to love books in your family! 1. Wild About Books by Judy Sierra – In this fun rhyming book-loving story, librarian Molly McGrew takes her bookmobile to the library. After reading them a story, the animals are wild to read more. She finds the perfect match for each animal, even finding waterproof books for the otter who adores Harry Potter. 2. 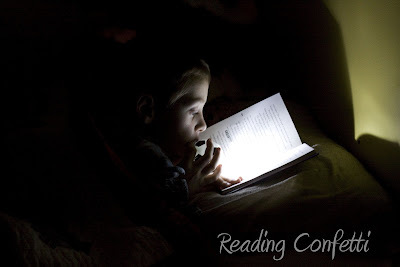 5 Little Monkeys Reading In Bed by Eileen Christelow – Mama has read 4 books to her 5 little monkeys and tells them lights out. They can’t resist reading a few books though. During the sad book they weep so loudly that Mama has to come in. The scary book and the joke book follow, eliciting shrieks and laughter from the monkeys and prompting return visits from Mama. When the monkeys finally settle down to sleep strange noises coming from down the hall cause them to investigate. It’s Mama reading the books!! The rhyming, predictable text, and adorable illustrations make this a perfect book for preschoolers. 3. The Bee Tree by Patricia Polacco – Grandpa shows Mary Ellen how the sweetness inside books must be worked for by taking her on a hunt for honey. Perfect for children who are learning to read, especially those who might be struggling. 4. Miss Brooks Loves Books (and I don’t) by Barbara Bottner – Miss Brooks helps all the children in her class find books they love. Missy is a tough customer, though, and dismisses them all until Miss Brooks finds her a book she loves too. 5. Good Books Good Times by Lee Bennett Hopkins is a collection of great poems about the joys of reading. Two of my favorites are “Give Me a Book” and “I Met a Dragon Face to Face”. 6. The Wednesday Surprise by Eve Bunting– As a birthday surprise for her father, Anna and her grandmother are working on their reading. The twist is that it is Anna who is teaching her grandmother to read! This is a book with a wonderful message about the joy of reading and learning from each other and is suitable for almost any age. 7. I Can Read with My Eyes Shut by Dr. Suess– Read the reviews of this book on Amazon, and you’ll get lots of opinions about the message in the book – it’s about the importance of sight, it’s meant to get children to memorize books, it’s about how you see much more of the world with your eyes shut. My personal opinion is that it’s about how reading opens up the world around you. Whatever the message, it’s classic Suess with silly rhymes and fun illustrations. 9. Lola at the Library by Anna McQuinn is a sweet book-loving book for preschoolers about a little girl and her mother going to the library. She has her own library card and gets to choose any book she wants! 10. Dog Loves Books by Louise Yates is about Dog who loves books so much that he opens his own bookstore. He’s a little disappointed when nobody comes to buy books. Luckily, he has lots of books to keep him occupied and before he knows it, he has a customer! 1. Get every child their own library card. 3. Do a book swap with friends, classmates, or neighbors. 5. 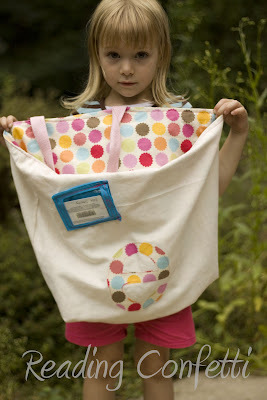 Dedicate a special bag for each child to take to the library. 7. Put on family plays based on a favorite book. 8. Share your own childhood favorites with your children. 9. Find special places to read. Blanket forts are great! 10. Be a great role model by showing enthusiasm for books. Keep reading with older children and make time to read your own books. 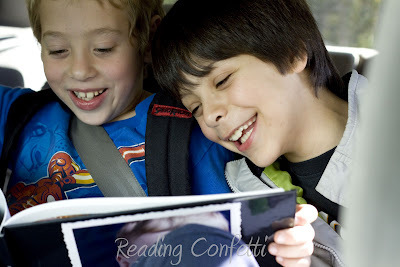 Bio: I’m Lorie, a reading specialist turned SAHM to two preschoolers. I blog over at Reading Confetti, where we do fun activities and crafts related to children’s literature. Now that my daughter finished the Harry Potter series(about a week ago), I noticed that she hasn’t been reading as much. I’ll have to get her to the library so she can find a new series!! Picture books- Library Lion is fun, too! We love to read over the summer and participate in all of the book incentives at books stores and libraries. My kid’s love A Series of Unfortunate Events books. I haven’t heard of that one. I can’t wait to check it out! May I add The Lonely Book by Kate Bernheimer (April 24, 2012). Our library got’s it’s copy today and after reading it I can honestly say that this is one of the most beautiful, both text and illustrations, books about a book that I’ve ever read. The story is about the life-cycle of a library book from “new” shelf to it’s ultimate fate at a library book sale. Books are source of intelligence..It’s nice to see children reading different kind of books.. Thanks for having it here..